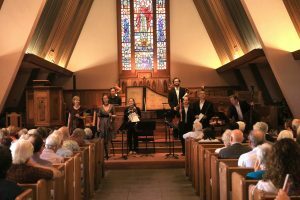 The Carmel Bach Festival will present Bach’s Christmas Oratorio as the composer intended, performed in multiple concerts on different days, rather than in a single performance. 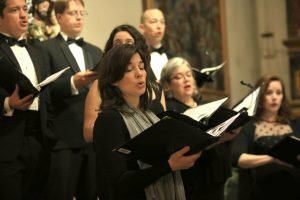 The Christmas Oratorio is exuberant music, brimming with joy and hope. The choruses are jubilant and often feature brilliant and festive orchestration. But the Christmas Oratorio has a quieter, more personal nature as well, well-suited for the performances at All Saints’ on Monday afternoons. 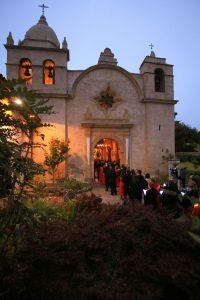 The six cantatas comprising the Christmas Oratorio are divided among different programs and venues as follows: Parts I and II on Sundays at Sunset Center, conducted by Paul Goodwin featuring the full orchestra, chorale and chorus, Parts III and VI on Wednesdays at the Carmel Mission, conducted by Andrew Megill featuring the chorale, and Parts IV and V on Monday afternoons at All Saints’ Church, directed by Andrew Arthur featuring the vocal soloists. Embedded in the brilliance of the orchestral writing in the final chorus to be performed on Wednesday evenings at the Carmel Mission, is the reappearance of the Passion chorale–a very familiar melody heard throughout St. Matthew Passion. This closes the Christmas Oratorio and links its celebration to the Passion saga. But here it is found in the most hopeful and joyous context possible: Bei Gott hat seine Stelle/Das menschliche Geschlecht (The human race has its place at God’s side). Christmas, 1734 in Leipzig: The Kantor of St. Thomas Church, Johann Sebastian Bach, had of course been supplying cantatas for the complete liturgical cycle in that city for many years at this point, including ones especially designed for Christmas. This particular year he offered a new concept for religious celebration during the Christmas season, an oratorio. What Bach called an Oratorium in this instance is actually a cycle of six distinct but related cantatas, united by their narrative and certain musical characteristics. Each cantata was originally to be performed at the two principal churches in Leipzig on various days during the twelve day Christmas season. Parts I-III were first heard on Christmas and the two subsequent days in 1734, and Parts IV-VI on the three days leading to Epiphany in the New Year. These first three form a subset by virtue of their instrumentation and key centers: Parts I and III feature trumpets and timpani in D Major—a festive, celebratory combination associated with royalty. Part II features woodwinds, suggesting a pastoral setting suitable for the Nativity in the more subdued key of G Major. Most of the music was originally composed for secular cantatas (BWV 213-215) praising royalty. With the assistance of a librettist–probably the poet Christian Friedrich Henrici, a.k.a. Picander–Bach reset this music with texts derived from the gospels of St. Luke and St. Matthew with the addition of poetic material. This technique—called parody—and the practice of compiling large works from previously composed music were commonplace in Bach’s time: his own B Minor Mass and Handel’s Messiah are prime examples. Narrative recitatives, a Sinfonia, and some arias were, however, newly composed. It should come as no surprise that in the original secular version, the text for the opening chorus in Part I was Tönet ihr Pauken! Erschallet, Trompeten! (Sound, ye drums! Ring out, ye trumpets! ), originally celebrating the birth of Empress Maria Josepha of Saxony a year earlier. The spirit of this music easily adapts to Jauchzet, frohlocken (Celebrate, rejoice!) and this cantata now concerns the birth of Christ. The Evangelist begins the story of Mary and Joseph’s journey, followed by the also singing about a wedding. A setting of the so-called Passion chorale (Hans Leo Hassler’s Herzlich tut mich Verlangen) in Wie sol ich dich empfangen (How shall I receive Thee) might be intended as a harbinger of the crucifixion. Er ist auf Erden (He came poor upon earth) is a unique combination of arioso, recitative, and chorale: oboes, bass soloist, and soprano fulfill these respective roles. The virile bass aria Grosser Herr (Great Lord), with trumpet obbligato, marks the contrast between the royal, heavenly destiny of Jesus and his humble surroundings. The closing chorale, Ach, mein herzliebes Jesulein (O little Jesus, dear to my heart) blends tender images of Jesus as an infant with fanfares reminding us that He is, indeed, a King. An instrumental Sinfonia introduces Part II. As in Handel’s Messiah and Corelli’s Christmas Concerto this “pastoral symphony” is meant to depict the Nativity. The droning wind instruments and lilting 12/8-meter siciliano characterize a baroque Christmas tradition of rustic piffaro music, suggesting shepherds with their bagpipes. Bach’s version is the most elaborate and richly scored of all, colored by flutes, oboes d’amore, and oboes da caccia. This exotic orchestral color reappears in subsequent movements, unifying the cantata. Recitatives convey the familiar Nativity story from the gospel of St. Luke (“And there were shepherds abiding in their fields”). In a tenor aria with flute, the shepherds are urged to make haste to see the baby Jesus, to refresh their hearts and minds. The word labet (refresh) is highlighted with extended melismas. The alto aria Schlafe, mein Liebster (Sleep, my Dearest) is a lullaby, with gently rocking bass octaves. The final chorale combines the Lutheran hymn tune Von Himmel hoch with shepherd music from the Sinfonia. The adoration of the shepherds is addressed in Part III, first performed on the third day of Christmas. Trumpets, flutes, and timpani return to the ensemble to add brilliance to a hymn of praise in dancing triple meter, Herrshcer des Himmels, erhöre das Lallen (Ruler of heaven, hear the laughter). This music originally served as the opening to the secular cantata, Hercules at the Crossroads, BWV 213. In Lasset uns nun gehen gen Bethlehem (Let us now go to Bethlehem), the chorus urges one to go to Bethlehem, propelled by fleeting scales in the violins and flutes. A duet for soprano and bass, Herr, dein Mitleid (Lord, Thy compassion) offers comfort, enhanced by the warm sound of oboes d’amore. At the heart of this cantata is the contemplative aria Schliesse, mein Herz (Lock, my heart), with its soulful violin obbligato wherein Mary reflects on the miraculous events and resolves to keep them locked in her heart. The cantata concludes with a reprise of the opening chorus. Part IV, for the Feast of the Circumcision on January 1, concerns the christening of Jesus. A pair of horns colors the opening chorus of praise to the as yet unnamed Son of God before the Evangelist pronounces His name in an ensuing recitative. At the center of this cantata is the “Echo” aria, Flüsst, mein Heiland (O, my Saviour), for soprano with oboe. The oboe creates its own echoes, while on offstage soprano enables multi-layered echo effects in different combinations and phrase lengths. Framing this aria are recitatives by the bass, joined in brief ariosos by soprano in chorale melodies. The tenor aria Ich will nur dir (I will live only) is reminiscent of Bach’s Double Violin Concerto, its vigorous fugal writing appropriate for the topic of strength and courage. The horns return for the final chorale, Jesu richte mein Beginnen, (Jesus, direct my beginning) built on an original chorale melody by Bach rather than from the traditional Lutheran canon. The Adoration of the Magi is the subject of Part V, scored for two oboes d’amore and strings. The instrumentation and key choices support the contrasting imagery of darkness and light. In the opening chorus, A Major is a particularly bright and resonant key for stringed instruments. The Evangelist tells of the coming of the Wise Men, and in the following movements a series of dialogues unfold, separated by reflective arias. In the first, the Wise Men ask, in a chorus familiar from the St. John Passion (Wir haben keinen König), where to find the newborn king, to which the alto responds to look within. The Evangelist describes the anxiety of King Herod, depicted by trembling strings, and the alto questions his fear. In between, a chorale and a bass aria, Erleucht auch meine finstre Sinnen (Enlighten, too, my dark thoughts) with oboe d’amore, examine the contrasts of light and darkness (F-sharp Minor being, in effect, the dark side of A Major). A mournful Terzetto with violin obbligato poses the question of when He will come, to which the alto interjects, Schweigt (be silent), He is already here. The simple concluding chorale depicts the light of Jesus filling the “dark pit” of our heart. The existence of a set of instrumental parts in Bach’s hand indicates that the music for Part VI was lifted almost entirely from a lost sacred cantata (BWV 248a). The return of the festive trumpets and the D Major key establishes symmetry with Part I. The triumphant tone of the opening chorus is repeatedly interrupted by dissonant episodes, reflecting the text’s reference to struggle with raging enemies. The next narrative portion concerns the deceitfulness of Herod. In a recitative, he questions the Wise Men about the newborn child, his final cadence striking an insincere tone similar to that of Peter’s denials in the Passions. The soprano unmasks his duplicity with Du Falscher (You false man) and the aria Nur ein Wink von seinen Händen (A mere wave of his hand) demonstrates the ease with which God can dispatch the unworthy. The Wise Men arrive at Bethlehem, but being warned in a dream of Herod’s intentions, ignore his demands and return directly to their homeland. The tenor recitative and aria, colored by two oboes d’amore, reasserts the futility of God’s enemies. A four-part recitative erases any fear of the terrors of hell, setting up the triumphant final chorale. Embedded in the brilliance of the orchestral writing is the reappearance of the Passion chorale, closing a cycle within this Christmas Oratorio and linking its celebration to the Passion saga. But here it is found in the most hopeful and joyous context possible: Bei Gott hat seine Stelle/Das menschliche Geschlecht (The human race has its place at God’s side).